Do you think homosexuality is a sin or an alternative life style? Is abortion wrong or is it a woman’s right? You behave according to what you believe, not what you don’t believe. I can recall having conversations with atheists who said they “lack belief in God”. They don’t believe or disbelieve in God. Yet, when I defend the Bible as being true or the Christian God as the only God, they are quick to attack my arguments in order to disprove God’s existence. So, I tell them that they are behaving according to what they believe, not what they don’t believe. It is inconsistent to say that you lack belief in something and then behave as though you deny the existence of that something. Without admitting it, their worldview didn’t “lack belief about God”; it denied God. There’s no getting around it. Different worldviews affect behavior — whether or not someone is aware of it. Since I’ve already mentioned atheism, let’s take a look at that perspective for a moment. How would an atheist answer the philosophical questions such as “How did we get here?” An atheist would probably say we evolved from lower primates. Of course he would deny that God exists and he would probably say that after we die, we cease to exist. Since there is no absolute God, morals would not be absolute. Instead, they would be based upon personal preference and whatever works in society. If God created the universe, then he is all powerful — since it obviously takes a great deal of power to create the universe. This would also mean that God is separate from creation and not a part of the created order. From the previous point where we see that God is absolute and unchanging, we could see that God’s nature would be reflected in the created order. As a painter leaves a part of himself on the canvas, so God reveals himself in creation. Creation is, therefore, ordered, predictable, and dependable. This would mean that when Christians look into creation, they would expect to find a predictable, regular, and testable world. This means that God, who is rational and intelligent, has impressed his image upon the hearts and soul of human beings. Therefore, people can be rational and turn their attention towards the world and since they believe that the universe reflects God’s creative nature, they can have confidence to look into creation and expect order. They can also expect that since they are made in the image of God, they have the ability to unlock the secrets of the universe. Also, if man is created in God’s image, then all people are worthy of respect and honor. Furthermore, if we are created in God’s image, then we did not evolve from lower primates. This would mean that we have purpose and are not merely the result of random development through evolution that is, supposedly, guided by natural selection. Natural selection works on the theory of survival of the fittest and this could have a very harmful effect on society if “survival of the fittest” is transferred into a moral principle. It would justify oppressing the weak and helpless. The Fall of mankind through our ancient father Adam, tells us that at the heart of every one of us is a predisposition toward sin. Sin is rebellion against God and, therefore, it is a rebellion against what is good. Sin has not only affected man’s soul and body, but it has also affected his mind. Therefore, the Christian worldview would say that even man’s best reasoning is touched by sin and cannot be perfect. Furthermore, since man is sinful and his heart’s intentions are predisposed towards wickedness, we conclude that those in power are highly susceptible to corruption. Therefore, governmental systems should be developed with Christian principles in mind to help guard against that. Because man is fallen, he is in need of rescue from God’s righteous condemnation — which is eternal damnation. Also, since he is fallen, there is no way he can redeem himself. Therefore, Jesus, who is God in flesh, died for us and rose from the dead. We receive his righteousness and forgivness by faith. This basic theological truth means that Christians should then preach that good news of redemption in Christ to all the world. Therefore, one of the most basic Christian principles is promoting Jesus as the means by which we are made right with God. Of course I have already mentioned the Bible, but the Bible is the inspired and inerrant word of God. 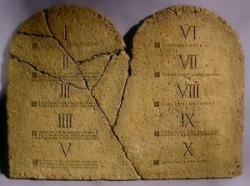 From the Bible we derive the truths by which we govern our lives. It is from the Bible that we learn about God himself, his created order, the Trinity, redemption, about sin, salvation, hope, and what is morally correct. The Bible reveals the will of God for mankind, for the family, for raising children, for proper behavior in society, etc. It is from the Bible that we can learn the direct will of God. It is from the Bible that we learn of God’s loving provision for us. We know that God lets the sun and rain fall down upon both the good and the bad. We know that God causes the crops to grow and cattle to multiply. We know that though we live in a fallen world, God has promised that he will never leave us or forsake us. Therefore, we can rely on God’s provision for us and should have confidence that he will continue to provide for our needs. So, you can see that there are basic principles which form the Christian worldview. There are more, but the above eight items are representative of Christianity’s perspective and truth and how it influences belief and action.